Are your adventure tours and expeditions safe? Yes. Safety always comes first. Our sea kayaking guides are seasoned veterans who understand our tour areas, the local waters, and weather patterns. All our guides have wilderness first aid training and carry radios. Is previous kayaking experience required to join your trips? No. Anyone, regardless of his or her level of experience and abilities, can enjoy our tours. Before setting out on the various adventures, we offer kayaking instruction and safety procedures. Many of our guests are first-time kayakers, and our guides are experts at helping everyone relax and enjoy the journey. What are the physical requirements to join your trips? Average physical health is required. Most of our adventure tours are not strenuous or physically demanding, so they do not require a high level of fitness. You should be capable of a few hours of moderate exercise each day. Still, these trips are adventurous, and every day is different; certain days might be a little harder to paddle than others. If you have any health problems, let us know when you are making your reservation so that we can plan to accommodate your needs and abilities. Please check the itineraries of each trip for minimum age requirements. The individual fitness level is more important than age. The hours of paddling on a particular day varies, depending on the destination as well as the group’s abilities and desires. Some groups like to paddle a lot, and some don’t. Our guides will adapt to the group’s interests and needs. Our trips can also include short rain forest walks, wildlife and plant interpretation/education, bird watching, swimming, camp fires, snorkeling, enjoying great food, beachcombing, and, of course, time to rest, relax, and enjoy the scenery. How stable are the kayaks? Can they flip over? The kayaks we use on our adventure tours are very stable and designed for comfort; the likelihood of capsizing is minimal. Before we embark, we go over safety procedures, which includes preparation for rescues. 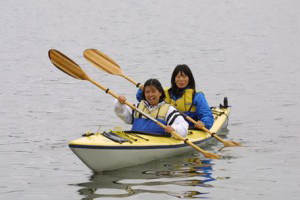 If your kayak were to capsize for any reason, our experienced guides will help you get upright quickly and efficiently. What Kind of Food is supplied on your tours? Fresh, local seafood, such as Salmon, Halibut, Ling Cod, and Red Snapper. Fresh fruits, hearty salads, and fresh vegetables like corn on the cob. Wholesome healthy breads like flat breads, pita bread, and whole grain breads. Selection of cold and hot cereals, such as Corn Flakes and oatmeal. Great pasta and rice dishes. Hearty soups like Clam Chowder, Chicken Gumbo, and Shrimp Gumbo. A variety of healthy snacks. In addition to meats such as fish and chicken, fresh beef may be served when possible. With advance notice, we can accommodate people with food allergies or special diets. Please refer to our Gear to Bring page for information on what to bring. We maintain a number of monitoring devices to know when whales are in our area but still like to use the element of surprise to enhance each trip. While the passage of pods of Orca, porpoise, and dolphins can happen at any time, Orca sightings most often occur during the daytime and sounds are often heard into the early evenings. Over many years of listening to vocalizations, we have become familiar with the vocals of numerous families of whales. The Orca, in its popularity, serves as ambassador to one of the richest marine ecosystems in the world. The bio-diversity of the area is astounding and includes many other cetaceans, pinnipeds, invertebrates, fish, and birds. We strive to give our visitors more than just a whale watching experience. We strive to offer a chance to gain an appreciation of the full richness of the area.